The casual visitor to Jean-Louis Deniot’s enchanting Paris apartment might be surprised to discover a charming old master hanging next to a striking contemporary black-and-white image, or marvel at the rounded walls that are offset by a cubist-inspired fireplace in his living room. 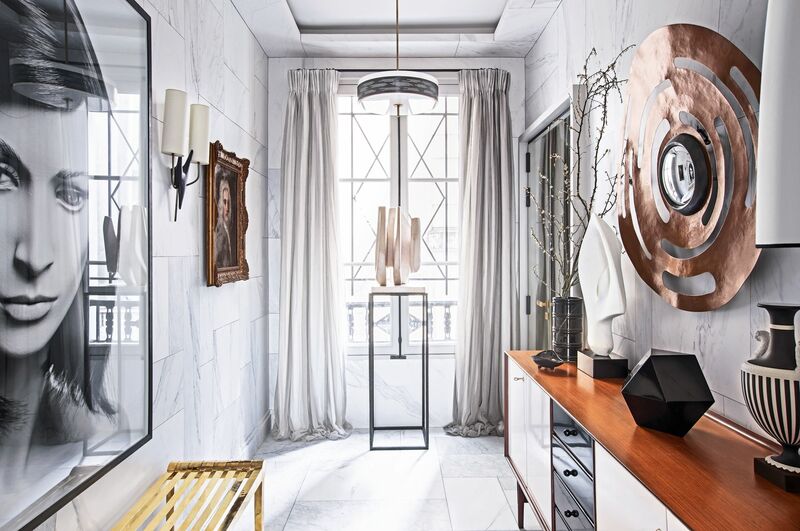 Such dynamic juxtapositions are the signature style of this audacious French architect and interior designer, who’s known for his fondness of neoclassicism and admired for his genre-mixing skills. With his evident talent and film-star looks, this A-list designer has attracted a great deal of global attention during his 20-year career, including his revamp of France’s Château Latour winery and his interior design for a palace in Chandigarh, India. He’s most recently put his mark on The Glebe—a set of luxurious detached homes situated along landscaped gardens in Chelsea, London. The walls and ceiling feature a ravishing panoramic painting of a cloudy sky by Mathias Kiss, perhaps alluding to the ceiling frescos of the 18th century or the view from the windows of a plane. This sense of lightness, exemplified by the living room walls and ceiling, is strikingly contrasted with architectural details and furniture from the 1930s and 1950s.